The road more traveled, part q.
I awoke with a sudden start to look up at cold white stars amid a bone-chilling black night. All around me I heard the swirling din of battle; amid the clash of blades, I heard deep-pitched shrieks, thundering grunts, deafening screams, and high-pitched witch-chants in the horrible language of Norden. Words came to me suddenly, and I spoke them out loud as I stood amid the wide and open fields. “Them changes,” I thought, as an answer. It seemed to fit my current delirious state of mind. More, my statements regarding those northern people were dangerously naive; I had underestimated them yet again. For some reason, a picture blasted into my mind, with two red-togaed 'Roman' legionaries taking on one of the people of Norden. To my astonishment, the spam crowded both of them at once, then as the Romans screamed high-toned Latin oaths, he ignored their blows and cut them down in seconds. Streaming with blood – mostly theirs, but some of it his – he then ran on with blood-dripping sword toward another knot of legionaries, all the while shouting strings of runes as a battle-cry. she brings enough people – and that stinky woman knows that. I found myself slowly floating downward amid a wearying conundrum, for while I could correct the weapons situation – I understood how to do that, at some level – I did not begin to have a clue as to how to undo centuries of 'inertial guidance'. Changing the hearts and ways of the multitude was a question for which I had no answer. No, not even 'no answer'. I scarce comprehended the true depth and breadth of the problem – and the problem was running rapidly my way amid the thunder of hooves and porcine squeals. I turned to my right to see a thundering war-pack of Iron Pigs rumbling down a dark corridor between two woodlots roughly a mile away. The pigs were moving at what looked to be a rapid trot, or roughly twenty miles an hour. Something 'told' me to duck, and I leaped for the ground as a blazing hot ball of fire shot scant feet overhead. I wasted no time getting out of the line of fire, and I circled around to the right. After minutes of frantic crawling, I looked up to see matters clearer. A pair of guns, each with a long and slender tube, now began to lower down their barrels as the gunners cranked furiously at their traverse and elevating handwheels. The myriad of rivets and 'crude' forging work implied the weapons to be old from my point of view. Perhaps they were up to World War One standards – or so I thought when one of the guns actually fired. The brief muzzle flame was small and of a hazy orange color, and the thin elongated cloud of smoke spoke of something other than black powder for a propellant. I wondered as to what was being used, even as I did not wonder as to the deafening scream of the shell as it flew downrange toward the oncoming herd of pigs. I waited for the explosion. But scant seconds later, a brilliant white eruption of fire billowed hot and crazily amid the front-runners of the pig-pack – and I watched in amazement as the pigs halted in their tracks and began shrieking. I looked closer. Two of the pigs had dropped in their tracks, while those near them were obviously injured. The milling pack toward the rear had scented blood. “Blood-maddened...” I whispered, even as the other gun roared out its challenge amid the gunners' shouts. Again, a shell screamed downrange to billow white-hot fire, and a hulking shadow lofted lazily skyward as the shell detonated to the right of one of the pigs. I heard a sliding rasp to my right, and the slow movement of the first gun forward spoke of its being ready to fire again. The gun fired, the shell screamed downrange – and shadowed in the brilliant flash was a moving thing from above. I heard its noise, that being reminiscent of a chainsaw's buzzing snarl. I looked up from the pigs, and nearly fainted. “Oh!” I squeaked, as a smoke-trailing biplane came on slowly from the east at tree-top height. Its light-tan blotched color and wobbling flight reminded me of 'The Red Barron' – until the plane shuddered into a shallow dive. Seconds later, a pair of small dark objects tumbled from the bottom of the plane, and it began to slowly pull out of the dive as it turned away from the pigs. The first dark object struck the ground with a brief billow of flame, then as the second object hit, the entire herd of pigs became engulfed in brilliant red flames. The plane then turned toward me as two of the pigs emerged from the holocaust surrounded by a horde of tinned thugs. The plane came lower, now but thirty feet above the ground, and the upper fuselage became alive with a blinking light. The howling sound of the engine, the trail of smoke, and now the fountains of dirt erupting amid the tinned thugs were enough for them. They ran in utter panic, and the flaming pigs followed them. The plane pulled out seconds later, and as it turned away, I saw the results of its pass. Those thugs that didn't drop from its gunfire had attacked each other – and as the plane climbed to roughly a few hundred feet, I saw another pair of similar planes wobbling to meet it. They formed up into a 'V' formation, and flew toward the west. The sky had somehow brightened markedly during this time of watching, so much so that I mumbled the words 'dawn patrol' amid the morning fogs of obvious autumn. A chill was in the air, and when I turned toward the sounds of horsemen, I needed to again 'get out of their way' to avoid being run over. “I'll want to head for some trees if this keeps up,” I thought, as the riders went by at a rapid walk. I then saw what they were carrying. None of these men – and women – were carrying flintlocks, or even what I was carrying. These weapons were part-stocked bolt-action rifles with long slightly curved detachable magazines. In the distance – easily four to five hundred yards away – I saw another swarm of tinned thugs. This time, they were flying a trio of red flags. The mounted riders halted, dismounted, and took up sitting positions prior to firing. The first shot was a revelation, for the bright white flash and roar spoke of a 'modern' weapon, while the glittering brass casing that flipped out of the receiver caught my eye as it lay upon the grass. The thugs froze in their tracks, save for one individual who crumpled to the grass. They looked around in obvious terror, even as another shot rang out, then a second, and a third. As the second man collapsed, the third looked down on his tin to see an obvious ripped hole over his belly. He dropped seconds later. The shots continued, and with the eighth thug dropping, the panic I had seen on faces here and there became 'global'. The thugs turned and ran back the way they had come, while the riders began picking up their fired shell-cases prior to remounting and giving chase. My vision became blurred, and when my sight cleared, I was in the middle of a sizable clearing. The chill in the air seemed magnified, so much so that I shivered uncontrollably until I saw what else was in the clearing. “What is that thing?” I gasped. A huge ' howitzer' or strange-looking mortar was in the process of being loaded from the breech. The shell – it resembled a small aerial bomb, complete with fins – went in first with the gun-barrel lowered to near-horizontal. The heft of the shell – easily six inches across, and nearly two feet long – was such that a small crane was needed to stuff it into the gun. The 'evil-looking' shell was followed by three sizable cloth bags. The first two of these bags were tied with blue string, while the third had a red-string reminder. One of the gunners spoke of it being an 'igniter bag'. “And if it is not in the mood?” asked another man. The barrel slowly cranked up to the angle mentioned, then a long 'string' was attached to the gun's 'lock'. This last screwed into the breach. The gunners took their distance from the gun, and the 'first' pulled the string. A huge reddish billow of fire shot from the gun's muzzle amid a massive dark cloud of smoke and a thundering roar. As this sound 'faded' in my ringing ears, I heard a whistling scream as the shell shot high into the air. The 'first' gunner was consulting an obvious pocket watch, while the others went to a 'caisson' or 'gun-carriage'. Here, another of the 'mines' was removed. It needed all three men as well as the crane, and once the bomb was put near the gun, I noticed the 'first' counting audibly as he watched far to the north. I now saw where they had been aiming the 'gun', and the distance was astonishing. The shell was beginning to descend toward the cove they had been aiming at. Its apogee – several miles – spoke of a prodigious range, and as the shell descended, I noted the cove itself. Three of Norden's ships had crowded it, and amid the trees a sizable camp lay, complete with numerous leather bags full of capped sticks of dynamite, mounded jugs of distillate, and some other things I could not identify. The shell's scream became steadily louder, until with a brilliant flash and horrific roar the entire camp seemed to vanish before my eyes. As the smoke cleared amid towering flames, I saw the remains of the ships sinking rapidly, while the holocaust illuminated the remains of thugs, witches, and swine. The camp had been wiped out completely, or so I thought until a herd of blood-maddened pigs rumbled out of the wreck and attacked a column of tinned thugs. The pigs – they had lost their armor – seemed insane with fury, and while they dropped soon enough, the thugs were slaughtered en-masse. But a handful survived the onslaught. I was now 'distanced' from the intimate surroundings I had found myself in, such that I could see clearly the larger picture. All over the first kingdom I saw such scenes played out, with the bulk of the activity happening within twenty to thirty miles of where ships had landed – save in the second kingdom. There, the port had indeed been plugged with ships, and between those people and the ones that had landed on the coast, the entire second kingdom seemed ablaze with fire. Gunfire rang out over the whole of the kingdom, with the second kingdom house being laid waste and the house proper turned into a blazing ruin. Casualties were beyond belief, with but one in twenty people outside of the potato country surviving. Everywhere I looked, I saw crude-looking letter 'T's made of rough-hewn wood. Each of them bore the butchered remains of a black-dressed thug or miser, while blackened stone 'altars' smoked furiously with the flames of sacrifice – and to look, act, or smell like a witch was the surest death-sentence imaginable. Further south, a small 'armada' had rowed with the goal of attacking the third kingdom's port. Here, I saw profound evidence of 'Thinker' activity, as these individuals had left a week prior to the main fleet's embarking. There had been pre-positioned supply dumps along the west coast of the continent, and the rowers had rested themselves on dry land every evening. Their attack had been just prior to dawn, and their surprise had been near-complete. Only the wearying effects of the week's travel diluted the fury of the thugs and the bloodlust of the pigs, and the third kingdom's port was wrecked beyond repair. Only the near-complete lack of food, water, and shelter slowed the steady advance of the pigs and witches, and only their comparatively modest numbers reduced the trouble they caused. They still destroyed everything in their path, and their trail was a lifeless burned-out swath several miles wide. The world blanked before my eyes, and when it reappeared, I was stunned. Here, I saw numbers of motorized buggies that resembled nothing so much as wire-wheeled shrunken sand-rails. These – there were sizable numbers of them, and they were quite capable – roamed the battlefield, and whenever the pigs or tinned thugs showed, the invaders were taken under fire using the heavy machine guns mounted on the vehicles' roll-cages. They had no chance whatsoever, unlike the first scenario. The first instance I had been shown meant thousands of injured and hundreds of dead in the first kingdom, with the thick of battle lasting two weeks and the mopping up over a month. Dozens of towns burned to the ground, while few places outside of those in the deepest interior remained unscathed. That was nothing, compared to what the second kingdom endured. By the time the mop-up phase had progressed enough to permit war-parties to head south from the first kingdom, the second kingdom had been nearly destroyed. The thugs and swine had endured few casualties in the process outside of the potato country, and when the first kingdom's hordes came into the border region, there was hue, cry, chase, and destruction for upwards of a week before the thugs and pigs were annihilated. In contrast to the smoke and fire of 'old-fashioned' warfare – referenced to where I came from – the second instance was so one-sided I had trouble believing it, until I saw the aircraft. The buggies were a primer for these things. While they looked commendably modern while parked on the runway, their brief takeoff runs amid near-total silence spoke volumes. “Stealth planes?” I muttered, as the third one lifted off with the grace of a bird to then climb steeply to altitude. The planes flew north in a ragged 'V'. Again, their silence and grace spoke loudly – until one of them abruptly 'vanished' before my eyes and then reappeared just as suddenly. The thought occurred to me that the current standard of 'stealth' – where I came from – in regards to these things was an understatement of the greatest imaginable magnitude. I then saw one of them waggle its wings and drop like a stone. The gymnastics of this plane seemed to defy all of the laws of physics at once, and once it began firing on the oncoming flotilla, the explosions and flames the plane sailed through unmolested were beyond belief. “That person's gotta be crazy,” I thought, as the plane twisted, turned, flipped, and skidded amid brief flashes of white near the nose of the plane. Still, a few boats managed to escape the planes, or so I thought until I saw them slowly settling in the water as they continued south. The rowers continued their long sweeps amid the hoarse chants of the witches, even as the sun slowly rose in the west, until one by one, the water rose triumphant over the gunwales and the ship in question slowly and majestically sank beneath the waves. Only a bare handful saw their 'promised land' before sinking. I awoke with an abrupt start to the sounds of bathing. The sun had set, and the smells of cooking food made for further awakening. I put the books away after checking my place in the current ledger, and staggered stiff and stumbling toward what looked like a campfire. “And north?” asked Kees, as he came out with clothing in his arms. “What was this?” I asked. “Did these things fly?” I asked. Gabriel looked at me, then nodded. “Why, have you heard of such things?” he asked. “Were they round?” I asked. I was thinking of either a radial or rotary. “What did it do?” I asked. “He said it mixed the fuel,” said Hendrik. “Was there but one?” I asked. Such descriptions threatened to usurp anything the group might think of as a story, and while I listened in to first Gilbertus speak of an old tale, then Lukas, I thought to examine the books I had looked at prior. I was once more deeply into that one particular chapter speaking of methods when Gabriel interrupted me. “Those 'K' things are these,” said Gabriel, as he pointed to four devices on the lower portion of what looked to be a crankcase. After a few more such comments, I returned to the book in question. It took several moments for me to learn that Gabriel was watching my every move and possibly attempting to read my mind. “Why is that?” asked Gabriel. His sudden 'oblivious' nature became obvious with the first word. “'Only you know your business'?” I spluttered. “The fact that most instrument-makers closely follow those instructions substantially reinforces those statements,” said the soft voice. “They're all witches, then,” I spluttered. I then looked at Gabriel again, and to my surprise, I saw him yawn and shake his head, then wobble back to the campfire. I returned to my studies. The 'yarns' I heard seemed relics of a bygone age, one I had read of in sundry books of one kind or another. I briefly paused, now wondering how the others felt at my 'absence', until I looked to see Hendrik absent as well. I suspected he had something on his mind that did not lend itself to 'frivolity', anymore than what I was reading permitted me to think of less-serious matters. I was surprised when Gabriel returned to my side a short time later. I had put away the instrument-maker's books, and was looking over my notes. “Uh, tinned thugs and swine do not handle certain noises well?” I asked. “I don't much care for depending on the strength of bubblegum and baling wire...” I thought. While Gabriel spoke of his ignorance regarding shoes, he accepted my assessment readily. I then thought to go down by the river prior to bedtime. To my surprise, the horses were munching on the riverside bunch-grass, and I turned back toward my 'bed'. I wanted a cover-sheet for the night, and once situated, I carefully covered my entire body before falling asleep. Morning went smoother than usual, and within half an hour of rising I was leading the column along the river's bank while looking for a way out. I soon found one, and we were back on the High Way but ten minutes later. “Your sewing was bad?” asked Gabriel. The end of the woodlot showed further meanderings of the marshy areas that had been on its northern side, and the winding nature of the river and its deep beds of reeds seemed to travel on interminably. It went somewhat to the south, and much more to the west, such that after a quarter hour, I could still see the river heading west. It had stopped heading south, and the wide expanse of deep-green reeds continued until they were swallowed up by haze and distance. The sun wasted no time in showing its heat, and I was glad for the more-frequent watering troughs. Farmsteads showed regularly amid the heather, and some enterprising people had carved small enclaves out among the woodlots. The aura of industry was palpable, and the traffic on the road was substantial for the first time since we had left home. Large slow-moving wagons rumbled behind six and eight horse teams, while buggies rolled smooth and quiet around them. We did also, though with a bit more noise. Some of the traffic stopped at the next town, which was about halfway to the larger one, and with a clearer road, we sped up a trifle. The place with the farrier's shop was less than an hour away, and I wanted to get there as quickly as was practical. I suspected the others wished to also, and when the town proper showed, I learned my suspicion was correct, even if my reason was concern for thrown shoes and not 'a proper breakfast'. I was left to my 'lunacy' then, for the Public House of the place drew all of them as if it were a magnet and themselves iron filings. They were going to do the 'commonplace' thing therein. As I led Jaak to the farrier's shop – it had a carved wooden post-type signboard in front of its yard, much as I had seen for Markus' shop – I recalled the vast array of impressions and talk I had heard about 'special' travel. Hard on the heels of this thinking, however, was the thought that no one – save 'desperate fools' – thought to travel this early in the year. The talk of students traveling made me wonder if they were included among those so labeled, and I wondered greatly. It suddenly became perfectly clear: that errand showed what was commonplace for 'business' traveling. My thinking was jolted by the smell of hot metal at the farrier's, and I came to the threshold of a sizable building with wide side-rolling doors. Peering within the darkened interior showed a number of anvils present, easily twice the number of the shop at home, and doorways into an obvious back-room showed what might have been either supplies or other machines. I saw no people. I then looked to my right. An older man with age-whitened hair sat at a small table just inside the door, with a wooden rack showing various sizes and shapes of horseshoes behind him. I turned and began to walk toward him. “Do they need to be larger, or a different shape, or..?” I asked, with a squeaking voice. His brusque manner didn't help much; I wanted to hide from him. He 'hitched' abruptly, then nearly fell out of his chair prior to limping off toward the nearest doorway into the back area, all the while muttering something I could not decipher. I heard movement in the rear as well as shuffling steps, then he returned to the 'main' area with a vastly lesser limp. I then saw his legs, and knew why he limped. One leg was perceptibly shorter than the other, and the longer one seemed more than a little stiff. He had a pair of horseshoes, one in each hand. “D-do you make those here?” I asked. He looked at me as if to 'take my measure', then seemed to 'dismiss' me as an ignorant wastrel with more money than sense. While I had considerable knowledge of what he spoke, his bristling attitude made for a dry mouth and a tongue that would not move. He seemed oblivious to what I was feeling, and his next statement seemed to bolster what I was discerning. “Let me fetch my tools, and I can show you,” I said. While Jaak remained in the shade of the building, I went back toward the buggies to fetch my tool-bags. It took some ten minutes, as they were buried under many of my things in the tub. When I returned, I was astonished to see a forge ready-burning with iron pieces just beginning to glow faintly red. I looked, saw no bellows, and nearly tripped over an ancient-looking handwheel jutting up from the ground behind the forge in question. I turned the wheel, and heard the rushing of the blast vary. “Do they make horseshoes?” I asked. I drew out one of the pieces of iron, looked at it, and began forging. “This stuff is s-soft,” I thought, as the metal moved like putty under the hammer. Within moments, I had four blanks close to shape and size – as well as a 'gaffer' who was draining mug after mug of beer between attempts to fill his ears with a soft white fuzzy material. While the shoes reheated among the charcoal, he wobbled over, then slowly looked at first the hammer, then my arms. He then used tongs to withdraw one of the ruddy shoes and looked it over with a practiced eye before replacing it and turning to me. He looked around after putting the shoe back in the fire, then adjusted the blast up a trifle. “Who, or what, are pfuddaarn?” I asked. The shoes were now the sunny red-orange color that spoke of ready working, and this time, I punched the holes and smoothed up the shoes afterward. Each shoe went deep in the coals once finished, and I added more charcoal at the end of the session. The 'gaffer' poked at them with his tongs, then briefly muttered. Jaak had his new shoes but twenty minutes later, and as I finished the last one, several people wandered into the place one by one. Two went into the rear area, and as I put away my tools, the entire group came to look at Jaak's new iron as well as his old shoes – and all the while, they muttered darkly. That situation was not helped by my laying down five large silver pieces. As I led Jaak back across the road, a faint hiss gave way to a sudden clangor that lasted for perhaps three seconds. Faintly in my recollection I recognized what machine that particular noise was associated with, and the matter turned over in my mind as I entered the crowded yard of the place. Hot on the heels of this sentiment was the thought that we would have a longer-than-common layover here, and when I opened the door, I knew I was being generous with my assessment. The singing and carousing was in full 'holler', and our table was already working on piled-high plates of food. As I meandered around the crowded tables, I noted the building's cleanliness, which compared favorably with that of home, and then the furnishings, and finally, the staff itself. These latter properties compared favorably with those of the Public House at home also. I drew closer to our table, and then wondered about food – until a frightful and unpleasant reek twisted my nose. I nearly spewed. I was more than a little surprised to find jugs of cider and beer at our table, as the popularity of the kerosene seemed astonishing. A less-than-vague miasmal cloud drifted over our table, and I grimaced in horror as it 'tickled' my nose. “Have you ever had distillate?” asked Gabriel between sips from a mug. I suspected his mug had beer. Lukas, Gilbertus, and Karl stood, then began moving toward the door. “I spoke of the shoes and made the needed arrangements,” said Gabriel. He then looked at my cap, and removed it gently. The entire top came away at his less-than-deft touch, and the rag I'd used nearly fell into his plate. Sepp stood and left post-haste. I found a mug and filled it with beer, and began sipping from it. Within moments, I felt calm enough to talk amid the uproar in the place, and the first word I murmured was 'pfuddaarn'. I drank an entire mug of beer and part of another before the viands at the table got my attention. The first of these was a sizable platter of what resembled close-sliced fried potatoes mingled with spicy-looking green bits of vegetation. I asked for some, and once I began eating them, I treated them with a measure of respect. “Who don't like to wait,” I murmured, around a mouthful of fork-tender 'roast'. “Her?” I asked. There were a number of people I knew or knew of who corresponded to 'her', and their multitude made for confusion in response to the question. I looked at Gabriel, who was trying to hide his face with a mug. He was drinking the thing dry. “And then, it gets weird,” he muttered, as he set the mug down and reached for a jug of beer. Another of those 'pregnant' pauses. Sepp returned shortly with a cloth bag, and once it was delivered up to me, I untied the string with fumbling fingers. Soft dark green cloth seemed to leap into my hands, and I removed a cap similar to what I had received but weeks prior, at least for shape. “And nothing is not good with your hair like it is, especially in this sun,” said Hendrik. “As a student?” I asked. “How do they dress?” I asked. Talk then went to what had happened at the third kingdom. As I had been unconscious during the majority of the time there, I listened eagerly. During 'intermissions', I put two slices of bread in my bread-bag, and when the comment of 'address' came up, I had a question. “The written format?” I asked. “At least I did my part, then,” I murmured. “Isn't there a standard?” I asked. “Those are the standards I spoke of,” said Gabriel. “Could I measure one?” I asked. Karl finally returned to the table, and as he finished his meal quickly, he spoke of the horses being 'full-shod'. I wondered about payment until Gabriel abruptly stood and left the table. Getting outside was something of a chore, and as we slowly moved through the dense-packed throng, I wondered as to whether we might have done better by leaving through the kitchen. Once outside, however, I had to shade my eyes for a brief moment. It was nearly noon, or so I guessed. Once back on the road and heading south, I was glad for the new cap. Not merely did it keep my head 'cooler', but the presence of a new cap acted as a spur to my thinking. I began to wonder about the blower, the furnace, possible machine-tools, and other matters. I described what I recalled of the lathes I had used before coming here. “I suspected as much,” I said. “You meant me doing the work without help, didn't you?” I asked. 'Methods' implied that to be the usual. “The outcome of that mission determines what we endure, then,” I muttered. As if to comment on what I had said, I heard faintly the caw of a crow or raven, then a 'clatter' that increased in volume as it came nearer. I stopped in mid-sentence as a mottled green-and-brown bird landed clumsily on the road and began 'crow-hopping' toward the nearest bush. The behavior of this bird, as well as its shape, suggested its nature, and when it turned back toward us, I saw the sizable yellow beak. It then cawed. “What is that bird?” I gasped, as it hopped and took wing. After passing two more watering troughs we came to another town. This one was the smallest of the three we had seen today, and in its rough middle, a road branched off between two buildings. While the road was neither the width nor the condition of the High Way, it was still a substantial road that saw much traffic. “And the others?” I asked. “Is there anything else in that area?” I asked. Between heather, woodlots, farmsteads, towns – two more before sundown – and watering troughs, the day passed in a haze of heat and what might have been humidity. It was now necessary to drink deeply and regularly, and at each watering trough, the horses not merely drank, but were also wiped down with cold water. I recalled that odd little 'rag-hunk' I had once used, and spoke of it once back under way. It was late in the afternoon, about an hour before sundown, and the worst of the heat was done. “Could we get some?” I asked. The lights went out at dusk and we continued on amid the again-growing traffic. For some reason, noontime had seen the High Way all but deserted, but once the sun went down, that road became alive again, with a train of lights swaying slowly amid clopping sounds. “How do they avoid running into each other?” I asked. The evening rapidly cooled the air, and with the coming of what felt like a chill, I began looking for a place to camp. I wanted a site some distance from the road – and as I began looking, I had a question. I found a 'meadow' in the midst of one unusually large woodlot, and led the group back to the rearmost portion. There was a secluded 'nook', and while the tents went up next to the trees, I thought to go further into the forest on foot. I was more than a little surprised to find a small 'pond' that bubbled faintly and gave off a potent 'mineral' odor, and when I scooped up a mouthful of its water in my cup, I thought to taste it. “Strong?” I asked, as I put the cup to my lips and then tasted it. The intense 'mineral' flavor was sufficiently off-putting that I began spitting, and I brought the cup back to the others just the same. All the while, I was muttering steadily. “What did you find?” asked Sepp. “You found a healing spring?” asked Karl. Karl took the cup from me, looked at it, and then took a swallow. He then drained the cup, burped, and wiped his mouth. “How could you stand that stuff?” I asked. Karl looked at me, then jerked. His face flashed a vision of purest misery. “Where is the privy?” he asked. “Find the shovel and dig one,” said someone from the other side of the nearest tent. Karl grabbed the nearest shovel, then ran for the edge of the trees and began digging as if he'd had lessons from a domestic gopher. He managed perhaps two minutes, and then put the new-made hole to use. “Did you put uncorking medicine in that stuff?” asked Sepp. “Does it smell like bad eggs?” asked Sepp. “And hence you don't get corked if you mix your wine with that water,” I said. “I'll take my wine in the cooking pot, thank you,” I muttered. A faint chorus of agreement seemed to come from everywhere at once. By the time our bathing finished, however, we had company in the form of a trio of freighting wagons. They began setting up small cloth-and-stick 'shelters', and amid the sounds of meal preparation and perhaps bathing, I heard knocking noises coming from one of the wagons. I turned to look at the source. The freighters were busily engaged in pulling the wheels of their wagons in the light of an uncommonly bright lantern, and as I watched, they cleaned both axles and hubs carefully before applying a thick black 'oil' to the hubs. “Are we likely to have more company?” I asked. By the time our meal finished, the freighters had been joined by what looked like a portion of a southbound vendor caravan and several tinkers. While none of these people were particularly loud, their intensely bright lights were enough to speak loudly of insomnia – or so I thought as I made ready to turn in. At least the central area of the clearing was clear of occupancy, and I fervently hoped it would remain so. “And if we hurry, we can get on it before it gets too crowded,” I thought. While there was no answer, I found no complaints when I began waking people up, and we left quietly under a fading moon. The path in question was barely wide enough for a single buggy, and when we broke out into a heather-dusted field at the south edge of the woodlot, I turned off to the side to wait. I waited for the rest of the column to come, and as I did, I noticed the dark brown earth between the bush-clumps, as well as the 'bunch-grass'. Gabriel came out, then the first buggy, and as I resumed along the now slightly wider path, I thought to look to the south and west. A faint dust trail seemed to steadily grow in length at a frantic speed some miles in the distance until it terminated at a woodlot. Seconds later, however, I heard a noise that nearly frightened me off of Jaak. The first portion sounded like a muffled explosion, followed by a earth-jarring thud. More thuds followed, each one following closer the one before, until the thuds merged into a rumbling uneven roar of such intensity that I trembled in fear. It sounded like an especially violent species of thunder, and the echoes rang in my mind. “What was that?” I gasped, as the noise gradually faded. The dust trail was long gone. “Tracks?” I asked. I had recovered much of my once-shaken composure. We made the High Way some minutes later, and stopped at the first watering trough we came to. Here, the pump seemed balky, and when I looked at it, I marveled at not merely its age, but also the obvious care in maintenance. “This pump needs a new leather,” said Lukas, as he worked the groaning device. But feeble spurts of water came from it. I finished my 'stint', then thought to try the pump. The first stroke was oddly silent compared to the former rasps and groans, and the second stroke worked with a perceptible resistance. The third stroke gushed water, as did the half-dozen I did following before Karl 'spelled' me at the pump. “I think it just needed priming,” said Lukas, as the rattle of harness and clopping of hooves came from our rear. I turned to see a halted pair of freighting wagons and a dismounted freighter coming nearer. This man was dressed much as we were, save slightly 'rougher', with an unusually 'large' revolver holstered in plain sight on one side and a large knife on the other side of his waist. He came to the pump, worked it once, then sputtered an oath. “It was not working until he worked it,” said Lukas. The freighter looked askance at me, then nodded slowly without a word. His partner now came up with a bag of tools. “Did they put rocks in it?” asked the second freighter. “Do you do that regularly?” I asked. “This is common?” I asked. “Who was Bart?” I asked. “He's working on a three-ring sextant,” blurted Karl. The freighter abruptly turned pale, then wiped his brow before turning to Karl. He spoke with trembling lip and more than a trace of fear in his voice. Thankfully, the pump did not lose its prime before we filled the trough, and the second freighter continued working it while we mounted up. I wondered if the pump would need repairs, and if so, when. “Perhaps just exchange them?” I asked. “That's quicker, but it costs more,” said Lukas. The High Way seemed to be heading uphill to a small degree as the sun rose, or so I thought, and to both west and east, there were the low broad mounds of hills. Otherwise, forests and heather intermingled as before, and the calls of birds and of animals seemed to usher in a greater aspect of strangeness, such that I now looked around in full expectation of seeing something too strange to readily believe my eyes. As we came from out of a densely-treed woodlot into a more-open one, I heard a terrible and echoing screech that rang for several seconds in my mind. To the left was a bipedal reptile that resembled a very overweight Komodo Dragon. The green and brown of this 'Lizard' made for a strikingly effectual species of camouflage, so much so that only its long worm-brown tongue gave its presence away. “What is that?” I asked, as I pointed to the lizard. 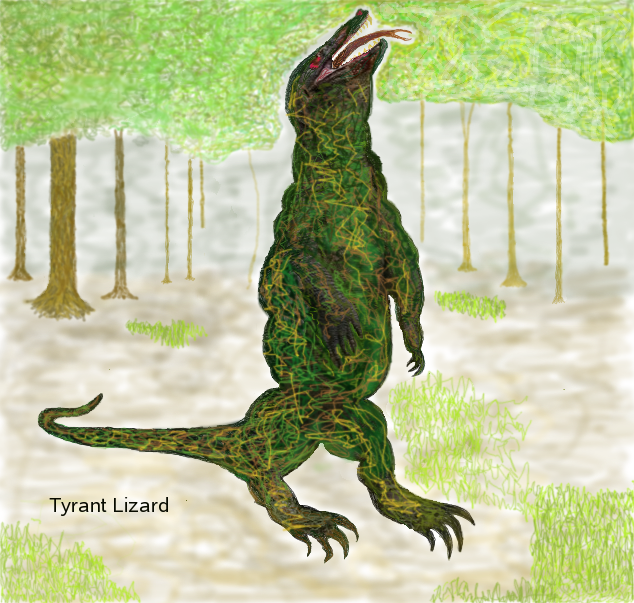 With sudden abruptness, the tongue of the lizard vanished to the sound of a long and drawn-out spitting noise – and the trunk of a tree some forty feet from the lizard's front erupted in a fireball that burned for several seconds to leave charred bark and tendrils of smoke. The first town of the day showed roughly an hour later, and the warmth of the sun was enough to make me glad for a cap. If anything, the temperature had climbed from the day before, and while the majority went into the Public House, the three of us who normally stayed outside to check the horses and buggies busied ourselves. I had had to turn in the oil-screws another quarter-turn the day before. “About how far is the kingdom house?” I asked, as I finished the hooves of another horse. Lukas was answered by a deep-bass bellow, and I looked hard to the right to see an 'oxcart', complete with a pair of straight-horn bulls in front. The bulls had drawn up short at the juncture of a dirt road and the High Way, and the person driving the cart seemed imported from the third kingdom house as to appearance. “What is he doing here?” I asked, as we left the oxcart in our wake. “They don't give directions?” I asked.